CNF’s programs improve the management of the national parks and nature reserves of the South Caucasus by providing financial support for operating costs as well as capacity-building tools. Effective park management ensures both that a park’s unique ecosystems and biodiversity are conserved, and that its protected status contributes optimally to the local community’s sustainable development, e.g. by promoting eco-tourism in the park or sustainable resource management in a traditional use zone, and by utilizing the eco-educational opportunities of the protected area for local schools and community activities. Goal: Cover core operating costs for 20 parks by 2020. Estimates indicate that Armenia and Georgia spend only about 50 percent of what is needed to cover even basic operating costs for their protected areas, such as salaries, utilities, maintenance, and equipment. Because donor support for these needs is scarce, CNF’s approach is to provide a long-term source of funding in the form of matching grants to maintain essential park functions. We also work with the parks to develop alternative revenue sources. In coming years, CNF will be focusing particularly on providing funds and planning tools, and building capacity for, facilities maintenance—ensuring that as part of ordinary park operations investments made by us and others are not lost. Management plans guide day-to-day operations in the parks and set short—and long—term priorities for administrators. When created with a participatory approach that involves local communities, farmers and other stakeholders, management plans can identify potential areas of conflict and propose land use strategies that conserve biodiversity while maintaining rural livelihoods. CNF has worked with international consultants and local NGOs to create a standard for management plans in Georgia and Armenia that encourages long-term planning and efficient use of resources. We ensure that management plans are created using a participatory approach and involve local communities and stakeholders. A conflict assessment is part of the management planning process and ensures land use and zoning issues are addressed and plans are put in place to resolve them. Goal: To support development of a viable biodiversity monitoring system and establish training and procedures to ensure ongoing implementation and data sharing among the parks. Biodiversity monitoring provides data on species population trends and ecosystem health, and enables analysis of threats and impacts from human interactions and changing environmental conditions. It is an essential conservation tool for appropriately managing a park’s natural resources and offers valuable information on the effectiveness of protected area management. Presently there is incomplete data for species in the Caucasus ecoregion, and most of the parks lack the capacity to implement even basic monitoring systems. 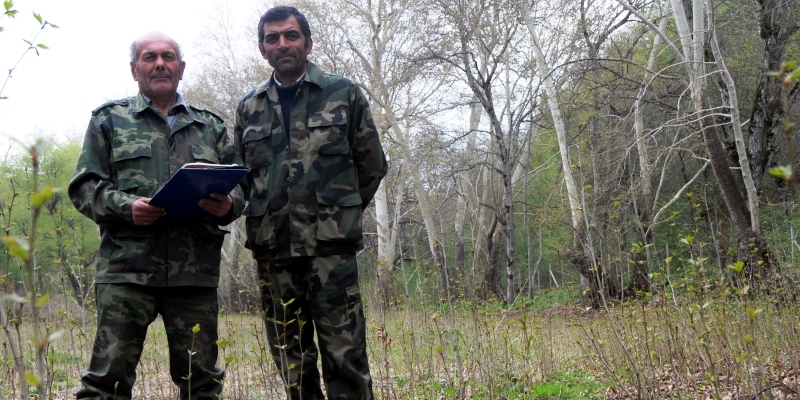 In 2014, CNF is co-financing the establishment of participatory monitoring system for endangered species in Borjomi-Kharagauli National Park in Georgia. This pilot project will act as a template for other monitoring systems in Georgia and across the region. Goal: To integrate economic opportunities into long-range planning for ecotourism and environmental education in the parks. The Caucasus region is known for its cultural as well as biological diversity. Half of its 35 million inhabitants live in rural areas where the main economic activities include raising cattle and sheep and small-scale farming. Overgrazing, logging and illegal hunting are damaging the region’s ecosystems, resulting in an overall loss of biodiversity and threatening the livelihoods of the local people. CNF encourages cooperation among governments, local communities and park authorities to promote sustainable development and nature protection. CNF funds support pasture use planning in traditional use zones in protected areas, and ensures that sustainable tourism plans are developed as part of the overall management planning for the protected areas which can provide alternative and mores sustainable economic opportunities to local people.